6380 1659 Little Feat Radio. Colonel Abrahams, ID, email, Swing Out Sister. SINPO 44333. SWC Holland reports: "Today Monday 24-11-2014 we received the message that the Medium Wave pirate Galaxy was raided. The raid was on Sunday afternoon 23-11-2014, time unknown. The frequency of Galaxy was 1512.0 kHz in the medium wave band. His location was Schagen in N Holland. No further information available from this Telecom Agengy action. This message could not yet confirmed by fellow pirates. It was also reported that Telecom Agency was in the street at Black Panther on this Sunday. The two pirates both live in the same province. 3905 2000 Radio Alice. REO Speedwagon "Take in on the Run." Good signal. SINPO 44433. 6242 1033 Radio Columbia. Dutch songs, utility QRM. SINPO 23332. 6267 1004 Cosmic Radio. Pink Floyd, ID jingles. SINPO 24332. 6285 1622 Bogusman. Reading emails, songs by Flesh and Primal Scream. SINPO 54444. 6295 1037 Radio Powerliner. Polka, ID, asking in Dutch for QSO. SINPO 44433. 6380 1629 Radio Carrierwave. Ultravox "The Voice." SINPO 34333. 6925 1027 Little Feat Radio. ID, said short test, soul music. SINPO 34333. 9900L 1646 Baltic Sea Radio. "Jungle Rock," ID jingle by woman with seagulls in background. SINPO 34433. 6280 1649 Cosmic Radio. Oldies. SINPO 24332. 6290 1642 Radio Odynn. Killing Joke "Love Like Blood." SINPO 44433. 6305L 1740 Over 60 Degree Radio. Blues music. SINPO 34333. 6747 1655 Radio Pioneer. Polka. SINPO 34333. 6380 1657 Little Feat Radio. Phil Collins "Sususudio," ID. SINPO 34333. 6747 1615 Radio Pioneer. Human League "Lebanon." SINPO 54444. 9912L 1603 Baltic Sea Radio. "Hippy Hippy Shake," ID jingle. SINPO 34333. We are happy to advise that our programme will be relayed by HLR - Hamburger Lokalradio on Saturday 29th November 2014 at 14:00-15:00 UTC (15:00-16:00 CET), on 7265 kHz, & our second programme at the same time & same frequency on Saturday 20th December 2014. Our thanks to Hamburger Lokalradio, & we are happy to be part of a radio team bringing life back to the international radio bands from Europe. HLR operates on FM in Hamburg, Germany on 96.0 MHz & on cable outlets, & also seeks to reach out internationally by organising a regular short wave schedule 3 days per week. Various official short wave frequencies are held & their transmitting station is in Goehren near the city of Schwerin (NE Germany) with a power of 1 kW, owned by MV Baltic Radio. The 'Chelmsford Calling World Service' is a light entertainment programme produced by Jim Salmon - 'Sunny Jim' from the Chelmsford Calling Network - set up with the aim of promoting radio technology past, present & future. Our programme is to be broadcast monthly via various short wave relay stations around the world & is also available to listen to online. Our aim is to re-create the fun & friendship of a regular short wave programme. We welcome listener feedback & suggestions. To get in touch, e-mail to - chelmcalling@gmail.com - or contact us via facebook or twitter. Couples of QSLs received this weekend. 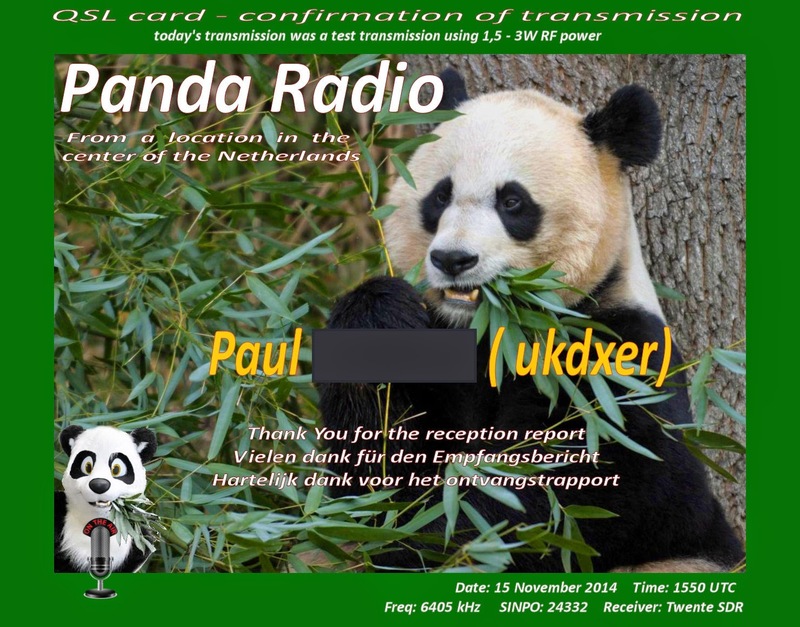 One from low powered Dutch station Radio Panda and the other from new Italian station Radio Europe. Thanks very much. 6205 0954 Radio King Shortwave. ID jingles, oldies. SINPO 44433. 6215 0912 Radio Uferlos. David Bowie "China Girl," ID jingle. SINPO 54444. 6245 0908 Radio AC DC. "Didn't I See You Crying." SINPO 44433. 6255 1007 Radio Casanova. ID, greetings, oldies. SINPO 54444. 6255 1649 Radio Telstar South. Slade, some utility splash. SINPO 43443. 6285 1012 Bogusman. Talk about weather, Sadies "Another Day Again." SINPO 44433. 6287 1643 Abu Dhabi Radio. Dance, country, Dutch. SINPO 55444. 6290 1002 Radio Scotland Int. QSO with Ronalisa. SINPO 44433. On 6300 at 1018 (54444). 6295 1018 Radio Quadzilla. Oldies, splash from Scotland, now on 6300. SINPO 23332. 6300 0916 Radio Ronalisa. Dutch music. SINPO 34333. 6305 0922 Radio Merlin Int. Sparks "Beat the Clock," ID. SINPO 34333. 6306 1640 Radio Joey. Hot Chocolate "It Started With A Kiss." SINPO 44444. 6319 1805 Radio Caroline-Rainbow. Pop/dance, ID jingles. SINPO 34333. 6375 1635 Radio Goofy. Dance music, ID jingles. SINPO 34333. 6380 0905 Radio Carrierwave. "More You Love More You Live," said closing down. SINPO 34333. 6385 1630 Little Feat Radio. "Here It Comes Again," "Rat Trap," utility splash. SINPO 43433. 6396 0930 Weekend Music Radio. Little River Band, ID. SINPO 34333. 6850 1739 Radio Europe. Italian station. Earth Wind & Fire "Boogie Wonderland." SINPO 44333. 6950 0947 Enterprise Radio. "We Are the World, ID jingle. SINPO 34333. 9485 0940 European Music Radio. REM "Man on the Moon," talking about comet landing, Electronic "Getting Away With It." SINPO 55444. 15880L Over 60 Degrees Radio. Blues music. SINPO 45444. 6215 1620 Radio Uferlos. Talk in German, inst music. SINPO 54444. 6265 1615 Studio 52. Greetings, "Bad Moon Rising," some SSB QRM. SINPO 43433. 6280 1630 Radio Merlin Int. Beach Boys "Californian Girls," Greets. SINPO 44433. 6285 1557 Long Live Radio. Tuning signal, ID. SINPO 34333. 6290 1545 Radio Caroline Int. Pop/dance, ID jingles. SINPO 44433. 6305 0905 Radio Merlin Int*. Reggae music, breaks in audio. SINPO 34333. 6306 1605 Tower Radio. Nena "99 Red Balloons," SINPO 54444. 6325 1554 NMD Radio. "Yesterday Girl," in Dutch, "Let the Light Shine On." SINPO 54444. 6380 0923 Little Feat Radio*. Pet Shop Boys "Domino Dancing." SINPO 44433. 6383 1551 Radio Baken 16. QSO, oldies. SINPO 54444. 6396 1646 Radio GSV. ID, song by female vocalist. SINPO 34333. 6405 1548 Radio Panda. "Summer of 69," SINPO 24332. 6747 1600 Radio Pioneer. Dutch songs. SINPO 54444. 6925 1625 Radio Mustang. "Touch Me Now," then 2 Unlimited. SINPO 55444. 2014 is the 50th Anniversary of both Radio Caroline and Manx Radio. To celebrate we are collaborating on a series of programmes to go out on both stations between Saturday 15th and Thursday 20th November. Shortly after commencing broadcasts in March 1964 Radio Caroline sailed its biggest ship North – broadcasting as it went – and dropped anchor in Ramsey Bay off the Isle of Man in order to beam its powerful signal into Ireland, Scotland and the North of England. Nobody ever expected it to happen … but 50 years on and Manx Radio has forgiven its cheeky competitor, and neighbour, and invited a unique partnership for one week, in order to look back "50 years on". 6290 1705 Radio Silverback. Dutch and country music, good peaks. SINPO 34333. 6305 1635 Radio Merlin Int. Beatles "Yesterday." SINPO 34333. Michael Finch owns what must well be the biggest archive of pirate radio tapes in the country. Like many who tuned into the pirate stations that saturated London’s FM bandwidth in the 90s, Finch recorded his favourite broadcasts on tape – not for posterity but to “share the wealth”, as he puts it, with his schoolmates. Few though can have had the dedication of Finch, who continued making recordings for over a decade. Every Saturday evening at 20 - 21 UTC there is a separate transmission via Radio Merkurs, Latvia on 1485 kHz. Saturday November 22 there is another programme via Hamburger Lokalradio at 13 - 14 UTC on 7265 kHz. The address remains citymorecars@yahoo.ca Thank you! Please send all E.M.R. reports to: studio@emr.org.uk Thank you! which you will find throughout the website (see the menu on the left). A father-of-two has been left with a court bill of more than £800 after he admitted running an illegal music radio station from his Northamptonshire home. Thomas Furniss, from Queen Street in Rushden, said he started broadcasting because of his skills in electronics and was not interested in music or becoming a DJ. Furniss, aged 27, was arrested after someone made a complaint to Ofcom in June about the pirate radio station, named “XS Radio”, which ran from February to July this year. The station was traced to his home in an investigation which cost almost £3,000. During a hearing at Northampton Magistrates’ Court yesterday, Furniss pleaded guilty to managing, financing, operating and running an unauthorised broadcasting station from his home. He was given a £280 fine, ordered to pay court costs of £500 and a victim surcharge of £28, and received an order for his laptop and transmitting devices to be forfeited. 3905 1946 Radio Alice. Rock n roll. SINPO 54444. 6070 0925 Radio Waves Int v Channel 292. Country music, ID, said been on air 31 years. SINPO 45444. 6205 0920 Radio King SW. Oldies, fair peaks. SINPO 24332. 6220 1939 Mystery Radio. Back on the air. Euro-pop and jingles. "Can't You Feel My Heartbeat," utility QRM. SINPO 53443. 6263.5 1643 Radio OZNRH (pres). Mellow jazz. SINPO 24332. 6285 0914 Radio Focus Int. Sheila B Devotion, win a radio competition. SINPO 44333. 6295 1605 Telstar Radio. "You Don't Love Me Anymore," SINPO 54444. 6295 2000 Radio Twentana. Dutch songs, 48m holding up better tonight. SINPO 34333. 6300 0903 Little Feat Radio. Greetings, soul music. SINPO 34333. 6305 1623 Radio Witte Reus. Pop, talk in Dutch. SINPO 34333. 6325 0908 Ronnie AM. Dutch song, greeting listeners, mention Pluto. SINPO 44333. 6385 1609 Radio Zodiac. QSO with Pluto & Phantom, Kraftwerk "The Model." SINPO 44433. 6385 1650 Radio Baken 16. "Loves Unkind," joining the QSO. SINPO 54444. 6803 1613 Radio Pink Panther. Dutch version of "Whisky in the Jar." SINPO 54444. 6925 1628 Trans Europe Radio. "Golden Brown," "Glittering Prize." SINPO 44433. 6950 1955 Radio Enterprise. Euro-pop. SINPO 44433. 6995L 1620 Baltic Sea Radio. "Sweet Caroline," jingle ID/email and off. SINPO 34433. 6255 1852 Radio Telstar South. Sixties music. SINPO 34333. 6285 1858 Radio Focus Int. Van Morrison song, IDs, competition to win radio. SINPO 44433. 6940 1844 Premier Radio Int. "Boogie People," SINPO 34333. 4026 1823 Laser Hot Hits. Dance music, ad for FSN. SINPO 44433. 6290 1704 Radio Rode Adelaar. Dutch songs. SINPO 54444. 6295 1757 Radio Montferland. Kool & The Gang "Celebration. SINPO 34333. 6300 1810 Radio Norton. Music just audible but signals fading. SINPO 24332. From November 2014 to March 2015 EMR will be on 6190 KHz every 2nd Sunday with a repeat programme from last months Transmission. The time slot for EMR on 6190 will be 10.00 to 11:00 UTC. We will celebrate during all this month of November our 31st birthday. We will operate this year with only our low power txs of around 20 watts on several bands 48 , 41 & 26mb with a special QSL on each band. If you reach all bands another QSL will be set up for you as a GOLD QSL . We will operate on 41 & 26 mb from Sat November 8th until Tuesday November 11th afternoon. We can just invite you to keep listening. Have a nice month of listening. Without listeners like you our radio could'nt exist after 31 years. for UPS or Fedex ask us an alternative postal adress. 4026 2042 Laser Hot Hits. Gary Drew show. Greeting FSN, "Keep the Home Fires Burning." SINPO 54444. 6940 2025 Premier Radio Int. Gerry Rafferty "Baker Street," Al Stewart "Year of the Cat," ID jingle. SINPO 44333. 7621U 2057 Eldorado Radio. Reggae music. SINPO 34433. 4026 1750 Laser Hot Hits. Bonnie Tyler "Holding Out for Hero". SINPO 24332. 5995 0955 Radio Face de Blatte. "Somebody's Watching Me." SINPO 44433. 6235 1759 Technical Man. Electro music, ID. SINPO 54444. 6241 1509 Halloween Radio. Dance mx, spooky sounds, muffled audio. SINPO 34333. 6255 1730 Radio Telstar South. Bowie"Rock n Roll Suicide." SINPO 44433. 6280 1610 Radio Merlin Int. Female DJ giving out address, oldies. SINPO 44333. 6285 0945 Bogusman. Chat and alternative music. SINPO 44444. 6285 1534 Radio Night Pirate. Dutch songs, ID, greetings. SINPO 44433. 6288 1745 Radio Rode Adelaar. Country & Dutch songs. SINPO 54444. 6306 1505 Radio Joey. "Get Fresh at the Weekend," SINPO 54444. 6325 1531 Radio AC DC. "Rawhide," then Status Quo, sudden off. SINPO 44433. 6385 1737 Bogusman. Another helping of Mr Bogusma. Talk about Stephen Hawkin, Be Bop Deluxe. SINPO 54444. 6390 0950 Radio Altrex. Cyndi Lauper "Girls Just Wanna Fun." SINPO 34333. 6396 0918 Weekend Music Radio. Shakin' Stevens song, Jack talk about the hoax WMR station. SINPO 34333. 6940 1539 Radio Enterprise. "Let's Get Physical," ID, echo on voice. SINPO 54444. 6950 1519 Laser Hot Hits v Blackbeard. "All Night With You," then Communards "So Cold the Night." SINPO 44433. 7300 0914 Radio Arcadia. Easy listening music. SINPO 34333. 7480 0905 Skyline Radio Germany. Talk in German, rock. SINPO 34333. 7500 0900 Crazy Wave Radio. Rock, greetings. SINPO 54444. 7700 0935 FRS Holland. Repeat of last week's broadcast. "RadioAfrica," also on 9300. SINPO 54444. 9300 0940 FRS Holland. Unfortunately utility QRM on this frequency. SINPO 42432. Radio Grote Verzierder was raided while broadcasting according to information on the SWC Holland website. 3915 2030 Radio Alice. ID, dance music. SINPO 54444. 3940 2100 Crazy Wave Radio. Rock. SINPO 34333. 4026 1642 Laser Hot Hits. Joan Armatrading, then Japan. SINPO 34333. 4890 2110 Radio Arcadia. Mellow jazz. SINPO 24332. 4900L 2105 Radio Minipower. Moved from 5825. Disco. SINPO 34433. 5825L 2055 Radio Minipower. Kool & The Gang "Let's Groove Tonight." SINPO 44433. 6240 1637 Hitmix Radio. Talk in German, BZN. SINPO 44433. 6263.5 1425 Radio OZNRH (tent). Mellow jazz, occasional bursts of utility. SINPO 23332. 6282 2040 Radio Enterprise. Iron Maiden, ID jingle, good peaks, fading. SINPO 34433. 6300 1615 Radio Black Power. Dance music. SINPO 54444. 6305 1417 Radio Merlin Int. Sweet "Jailbreaker," ID. SINPO 34333. 6803 1434 Radio Pink Panther. Dutch songs. SINPO 54444. 6955 1610 Trans Europe Radio. "Come Up and See Me," "If I Had Words," closing down." SINPO 44433. 6975L 2050 Over 60 Degree Radio. Blues music. SINPO 34433.